Catch a ball game, a fish fry or an independent movie…all happening this weekend! Elks Lodge No. 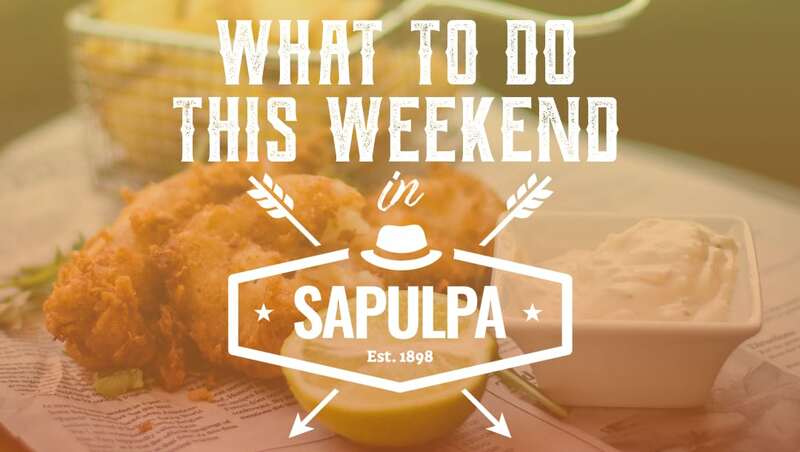 118 Fish Fry from 5 p.m. to 7:30 p.m. at the lodge, 24 South Poplar Street in Sapulpa. Join them for their monthly fish fry for $7.50 plate. Enjoy good food, good times, and great people! For more information call 918-224-1118, or go to their Facebook event page here. Neither Wolf Nor Dog Movie Showing at B&B Sapulpa Cinema 8, 1245 New Sapulpa Road. Come see this “landmark” independent film before it stops playing! For more information on the film and additional showtimes, please visit the Facebook event page here. Chieftain Alley Pre-Game Fan Tailgate Experience from 5 p.m. until 30 minutes before kick off. This is right outside of the Band Hall, across the parking lot from the stadium. They will have a DJ, food, games, giveaways, and more! For more information, please click here. Mug Night at The Painting Gypsy-Junkin’ Jypsies from 6 p.m. to 8:30 p.m. at 619 North Mission in Sapulpa. They are having a special glaze night and have a huge selection to pick from. All of the mugs are $6-$20 depending on the size, and the glaze fee is only $5. This is a great event for you to do with your kiddos! For more information, please visit their Facebook event page here. Sapulpa High School Varsity Football Game versus Claremore at 7 p.m. at the George F. Collins stadium in Sapulpa. Let’s root to keep that Big Blue winning streak going and to beat the Claremore Zebras! Cowgirls for a Cure for Childhood Cancer 3rd Annual Barrel Race at 12:30 p.m. at Lazy D Ranch & Equestrian Center, 7114 South 145th West Avenue in Sapulpa. All proceeds will go to fund cures for Childhood Cancer. Entries close September 7th at 8 a.m. For more information on the event and how to register please visit their Facebook event page here. Sapulpa Band Boosters Bingo at 4 p.m. (doors open at 3 p.m.) at the Sapulpa High School Commons. This event supports both SHS band and color guard students. They will be selling game packs for $15 each, which includes all games, including special games. There will be door prizes, a bake sale, a silent auction, and dinner! If you cannot donate, come on out anyway and play BINGO with us! This is a family-friendly event. Movies in the Park at Kelly Lane park in Sapulpa at dusk, presented by Sapulpa Parks and Recreation. Movies in the park is back for the fall! Bring your family and your picnic blanket to watch Star Wars: The Last Jedi on the lawn of Kelly Lane Park. Come early to enjoy the new playground equipment! This a free event. To contact Sapulpa Parks for more information, visit their Facebook page here. The Hinson Family at 10 a.m. at Open Door Fellowship, 405 East Taft Avenue in Sapulpa. Come enjoy a great service with the Hinson Family! For more information, please visit their Facebook event page here. 4th Annual Native Fest Inter-Tribal PowWow from 1 p.m. to 6 p.m. on Saturday, September 8th in downtown Cushing. They will have vendor booths, an art show, a golf scramble, tribal dancers, and much more! For more information, please visit their website here.